With stand up comedy taking the world by a storm, we thought it would be ideal to curate a list of specials you should not miss. From simple jokes about our daily lives to some of the darkest jokes you’ve ever heard, these guys do it all. Having recently returned to stand-up, Dave Chappelle released his special “Age of Spin”. Here, he talks about controversial figures such as OJ Simpson and Bill Cosby and his own run ins with the law while also giving us insight on his hilariously funny past! He has tales to tell if you’re in for a rib cracking evening. This Australian comedian shook the stand up scene in America and has already released 2 Netflix specials. Free Dumb tells us about Jim’s take on the presidential elections in America and also discusses the many problems the country is facing. He talks about his family and how different life in Australia is compared to America. If you’re someone who thinks political satire “trumps” all kinds of jokes, Free Dumb will make you reconsider. 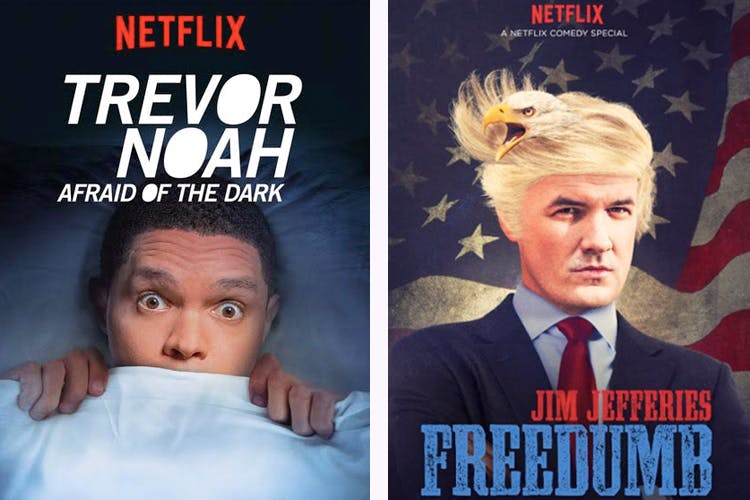 We’ve all seen Trevor Noah as the new host of The Daily Show, but did you know that he’s been performing stand up on the big stage since 2009? If not, then ‘Afraid Of The Dark’ is the best place to start. In this special, Trevor talks about his rough past in South Africa, his big move to New York and also does numerous on-point impressions of accents and famous people. British comedy has always had a very niche crowd, but not for this man. Considered to be a legend by many other comedians, Jimmy Carr started his work in the late 90’s and hasn’t stopped surprising the world with his dark and intense humour ever since. His interaction with the crowd in times of heckles is also super hilarious! All his skills are on best display in his special ‘Funny Business’. Like he says, your reactions to his jokes will tell you the kind of person you are. Known for picking up controversial topics and saying things most people wouldn’t even think of, Bill Burr is one of the most famous comics of our time. In his special ‘Walk your way out’ we hear him discuss population problems, feminism and he even tells us his opinions on Adolf Hitler and other matters that most people won’t be too comfortable talking about. Mostly known for being the head co-writer of the hit show SNL, Michael Che has also contributed his bit to stand-up comedy. In his special ‘Michael Che matters’ we get to know about his thoughts on issues like racial discrimination, gun violence, and other heavy topics like drug use in America. He also explains his views on the “Donald Trump Situation” (yes that’s what it’s called). Expect extremely dark humour. You’ve been warned. In this special, we get a chance to see Anthony Jeselnik express his views on major violent events that have taken place in America. Just for caution, this comic is most well-known for starting the trend of dead baby jokes – for him there is no such thing as too dark or too soon. Popularly known to the world as Fluffy, this stand up comedian has a very interesting take on his life. In his special ‘Aloha Fluffy’ we get deep insights into what urged him to start performing and also get to hear some funny anecdotes from his growing up years, his family and many other interesting topics. Take a look into the life of the infamous Kevin Hart. In his special ‘Let me explain’, Hart talks about the hardships of marriage, his post divorce life and delves into hilarious explanations to the numerous misdeeds he’s committed. He even expresses his view on the different experiences his kids come across compared to what he had to face in his own childhood.